"Adapted from Lynn Ogryzlo, author of The Ontario Table"
Bring a pot of salted water to a boil. Add pasta. Bring back to a boil and reduce to a simmer. Cook according to package directions. Meanwhile, warm oil and butter in a large skillet. Add mushrooms and garlic cloves and cook on high for 3 minutes or until soft. 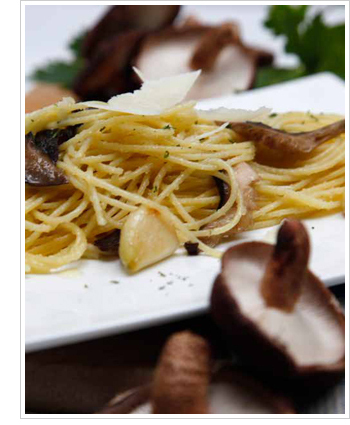 Remove mushrooms and set aside. Add shallots to the garlic cloves in the skillet and saute until shallots are wilted. Season well. Add white wine and reduce to 1/4 cup (60ml), about 15 minutes. When pasta is almost cooked, remove it from the boiling water with tongs and transfer it to the skillet. Swirl the pasta to coat completely. Add grated parmesan cheese, parsley and mushrooms. Season and mix well. 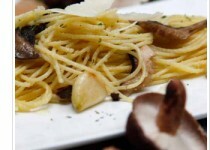 Divide among 4 dinner plates and garnish with parmesan shavings.